We are humbled to share that the “I Have A Dream” Foundation has received more than $30,000 in donations in memory of Tommaso Cerase. 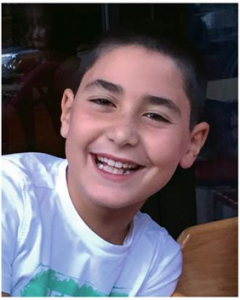 Tommaso was just nine years old when he died in September in a tragic accident during a soccer training camp in Manhattan. Tommy, as he was known to family and friends, was an avid soccer fan, budding artist, and loving son and brother. Tommy’s friends remember him as fun, social, and always generous in sharing his skills – like his talent for soccer – by teaching others. He was also interested in equal access to education and selected this topic for a school project that he titled, “Equal education for all.” To honor Tommy’s interest in education equality, his family chose the “I Have A Dream” Foundation as the recipient of donations from anyone wishing to give in Tommy’s memory. We couldn’t agree more, which is why we remain focused on providing Dreamers from some of the most economically disenfranchised communities with the same opportunities, resources and support as are available to higher income students. In the 36 years since our founding, our Dreamers have gone on to attend over 1,000 higher learning institutions and become diplomats, accountants, social workers, doctors, and actors, among many other careers.